Cinema’s greatest ménage à trois, among two best friends divided by the first World War and the definitive free-spirit, Catherine, full of love and destruction and played by Jeanne Moreau, for whom this picture certified international stardom. Shot by a production crew totaling in its entirety 15 people, financed by the star when the money ran out and filmed by cameras on bicycles, shuffling technique and sensibility like a deck of cards with its willful narrative and tonal shifts, this is the most enduring of the pictures to come out of France’s nouvelle vague in the late 1950s and early ‘60s, reflecting the influence of the new movement and then transcending it. 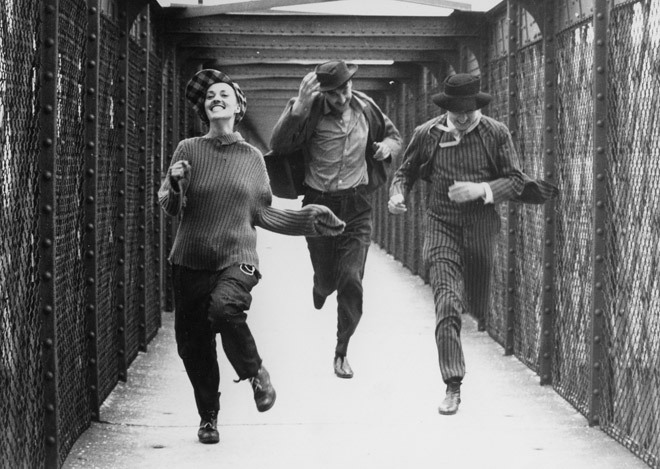 “A movie,” critic John Powers has called Jules and Jim, “that enters viewers’ lives like a lover.” In his masterpiece writer-director Francois Truffaut, just turning 30, never stacks the math on behalf of one or the other or the other in his triangle, regarding each with equal compassion and a sense of folly, knowing that love—at once the most rigorous and anarchic of passions, laying waste to every other human force around it—plays no favorites and picks no winners.